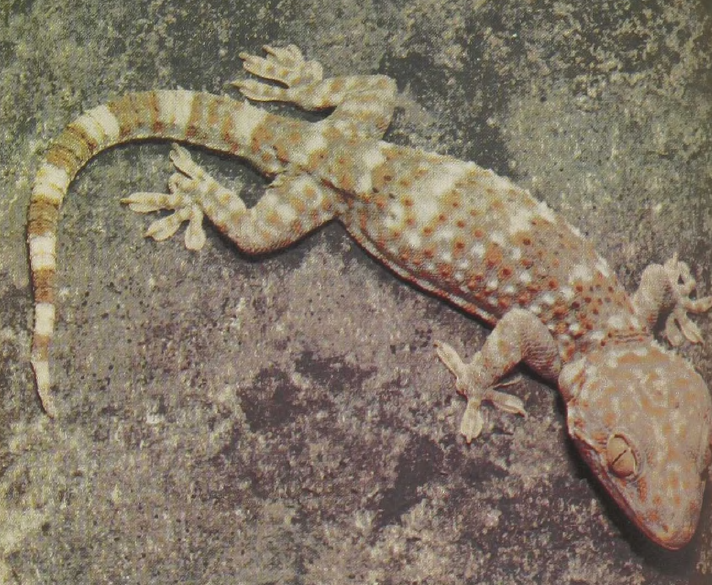 The east Asiatic Tokay is one of the larger members of the gecko family. Like many other geckos it can walk on walls and even on the ceiling. The scales beneath the toes are covered with cells that send out fine, hair-like processes that adhere to a surface when pressed into contact with it. The Tokay’s large mouth and sharp teeth make it an excellent predator. Like some other tree geckos, it has taken to sharing human habitation and may often be seen around lights picking up the insects attracted to them. Even large roaches, mantids, and beetles, as well as small vertebrates are taken. 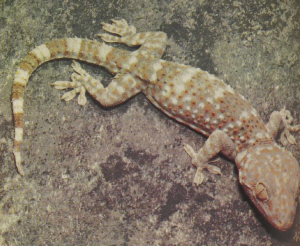 Most geckos are nocturnal and their eyes are well adapted for night vision. Geckos produce sounds and apparently hear well. They are social animals that respond to each other’s sounds and develop complex hierarchies. The females lay hard-shelled eggs which are glued to walls or in crevices.